Posted: Saturday 15th May 2010 in Events and Awards, News. 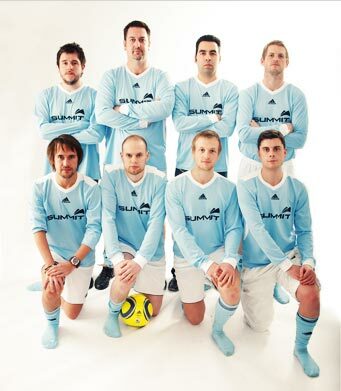 Summit took its first steps into the competitive world of 6-a-side football recently. The Townend Crazy Horses made a flying start to life but recently came down to earth with a bump. A team of mixed ability but unrivalled enthusiasm began their 6-a-side career with a well-earned point in their first game, managed to win the second with a solitary goal from the penalty spot and were sitting pretty third in the league after two games but things soon turned. A combination of injury and poorly-timed meetings in Prague has blighted Townend’s season so far. A total of five narrow(ish) defeats and a win (by default) have seen the side slip down to sixth in the league at just over halfway through the season. Goals have been hard to come by in recent weeks with only Russ and Tom registering for the Summit team. Yet with six games remaining, the boys will not lie down and accept mediocrity. Hopes are high that a flying end to the season can be achieved so that Townend can embark, full of confidence, on their next foray into competitive football – whenever that may be.